What do you call an annual event that attracts avid users of the friendliest integrated cloud platform that can run your whole business? Zoholics — of course. 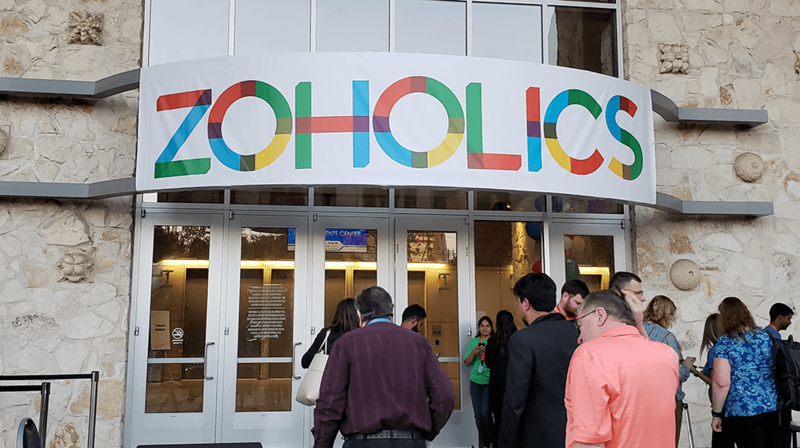 This week, April 9 to 11, 2019, over 1700 enthusiastic Zoho users descended on Austin, Texas to hear the latest news from Zoho. Zoho is the maker of Zoho One, an all-in-one cloud-based software that includes everything you need to run your small business. Zoho made three important new product announcements — each greeted with enthusiastic applause and even a few cheers from the Zoholics crowd. These include Commerce Plus, a fully integrated ecommerce platform; MarketingHub, an all-in-one marketing automation suite; and Orchestly, a business process workflow system. Zoho has joined the likes of Shopify by introducing a small business ecommerce platform, Commerce Plus. But Zoho aims to surpass existing solutions by offering the ability to not only do online commerce, but also tie it to CRM and accounting for a full picture of customer interactions. The company also built in personalization so that each shopper can receive a different experience customized to them. Customization includes the customer’s location, recently viewed items, Google search source, inventory availability and customer history, among other factors. The inventory portion integrates with Amazon, Ebay, Etsy and other marketplaces to centralize order management, according to Raju Vegesna, Zoho’s Chief Evangelist. Commerce Plus has attractive pricing: $100 per month, plus either $30 per employee or $75 per user. MarketingHub is a new application that coordinates and automates marketing activities. It helps businesses plan and execute marketing campaigns in an all-in-one suite, without having to deal with a cobbled-together patchwork of marketing technology by different vendors. The goal is to help small businesses automate activities saving time and resources. MarketingHub is included in the ZohoOne pricing bundle. Orchestly “orchestrates” business processes. Meaning, it helps plot out workflows and manage internal processes. It can be completely customizable to your business. For example, if you have an auto repair business, you can plot out the process from customer intake through the actual repair, said Vijay Sundaram, Chief Strategy Officer. Orchestly is also included as part of ZohoOne, which is $30 per employee per month, if billed annually. Zoho also announced plans to build a new U.S. headquarters in the Austin area, to the obvious delight of Austin Mayor Steve Adler, who was in attendance to kick off the event. The company recently purchased 375 acres of land near Austin, with the intention to build a 100,000 square foot campus. The U.S. headquarters eventually will move from Pleasanton, California. Zoho employs more than 7,000 people worldwide located across 12 offices in India, China, Singapore, The Netherlands, Japan and the UAE, in addition to the U.S.